Your cash situation should be loosening up thanks to Mercury returning to direct motion in one of your money angles, and Venus arriving there last week. But hold onto your funds for now, because you’re going to want capital for an upcoming project. Which project? That remains to be seen. 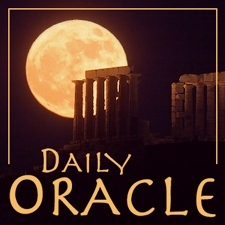 Today’s Oracle takes us to the Aries weekly for May 23, 2003. Your cash situation should be loosening up thanks to Mercury returning to direct motion in one of your money angles, and Venus arriving there last week. But hold onto your funds for now, because you’re going to want capital for an upcoming project. Which project? That remains to be seen, as you juggle your priorities and make several key decisions that determine the course of your creative life for the foreseeable future. I do suggest that technology would be a good investment. Not the NASDAQ but, for example, a good fast computer to do some very excellent and well-paying work on. Give your imagination some room to fly.